Day 127: A River Runs Through It . . .
One of the most beautiful parts about living in San Marcos, Texas is the San Marcos River. Historians have pegged life along its’ banks back 10,000-12,000 years ago. It’s natural waters flowing out of the ground at a constant 72 degrees and it’s some of the clearest water you’ll ever see. A famous tourist attraction from San Marcos’ past, Aquarena Springs, used to avidly promote rides in their glass bottom boats. The attraction has long since gone away–now part of Texas State University–but the glass bottom boats remain and for those who care enough to see natural springs bubbling up from the floor below, amazing turtles, fish, wild plants and a look at an eco-system that works, then you owe it to yourself to take a look. Beautiful rivers like the San Marcos are a rapidly dwindling commodity in our country. The ability (or inability) to balance recreation, consumption, commerce and protection is what can define a healthy river or a sick one. As water pours out of the headwaters, we quickly realize fresh water is one of the benchmarks of a healthy civilization. The San Marcos River is a terrific place to go floating in a tube or just sitting on the banks watching the water go by. . .it’s the sound of water moving slowly by that is mesmerizing. However, the same river can be mean and nasty and impossible to contain when nature puts forth heavy rainfalls. A river is a true study in ebbs and flows. . .some days its running wild and others it’s just flowing by. Tonight we travel to the Columbia Valley of Washington State for a red blend that we found at Gabriel’s. 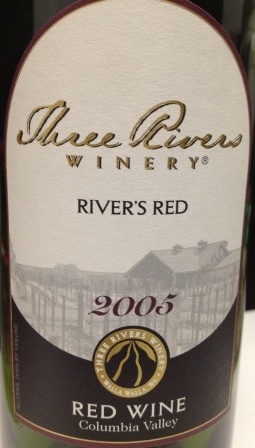 Priced under $15, this Merlot, Cabernet Sauvignon, Cabernet Franc, and Syrah blend is a 2005 Three Rivers Winery River’s Red. It kind of sneaks up on you. . .a medium body wine, it’s tannins were soft and the fruit was almost hidden. The wine got better as it opened up, but we were a little concerned initially because the nose was ‘missing’ and the initial taste was bland. However, as time wore on, the wine definitely began to show its’ strength with an earthy–almost herb and spice kind of taste and the fruit–mainly black cherry–really came through. The color was a dense maroon. . .almost bordering on coppery, but the cork was soft, supple and had held the wine nicely. We paired it with a veggie pizza loaded with extra cheese and garlic. . .the wine went very well with it! At the end of the bottle, we both liked it, but wouldn’t go so far as to say we loved it. Chances are, we’d opt for a different bottle in the future, but worth a try at the price. Clearly, Washington has some amazing wines at very attractive prices, but we’ll probably keep on sipping past this one. The beauty of the river is tough to beat. When we lived in Kerrville, the Guadalupe River ran through the middle of town as well. . .it was a beautiful river when flowing normally, but we’ve also seen how mean and nasty is can be when rainfall is heavy. Floating the Frio River in the southwestern part of the state, you learn immediately: A) It’s very clear and B) It’s very cold. . .they don’t call it the “frio” for nothing (translated: cold in Spanish). They are a key part of what keeps us going; their fresh water provides many of us drinking, bathing and washing water. It’s something that we can’t take for granted. On a separate note, tomorrow (Sunday) will be Jean’s Dad’s (Bill) birthday–there’s something special about being able to celebrate a parent’s birthday– especially as we get older and our children become adults themselves. Be sure to cherish your parents’ birthdays. . .you’ll miss them when they aren’t there to celebrate any longer. Happy Birthday, Bill!! As we settle into the first weekend in 2013, please enjoy your favorite wine responsibly and remember to recycle and reduce trash whenever possible. Categories: Uncategorized | Tags: Birthday's, Frio River, Guadalupe River, Kerrville, San Marcos River, Three Rivers Winery Columbia Valley, Washington State | Permalink.